We love celebrating awesome geeky people around here. 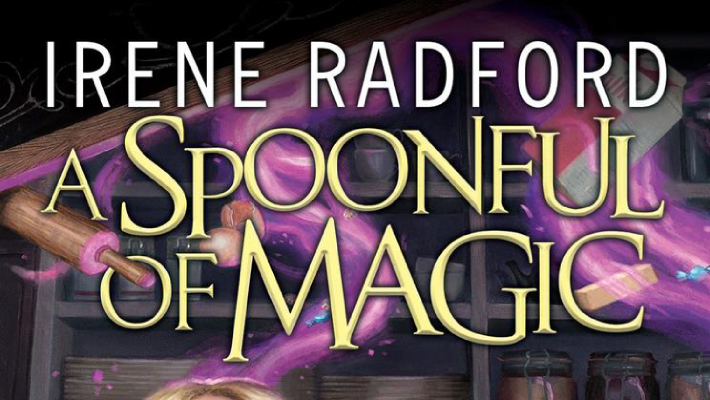 Recently I had a chance to reach out to author Irene Radford, author of Spoonful of Magic, on behalf of our community. In true Geek Girl Pen Pals style, we have asked Irene to tell us about her top five geek loves. Enjoy! 1) When I started working on “A Spoonful of Magic,” DAW Books, November 2017, I considered myself an indifferent cook. I know the basics. My mother made certain of that. I’ve cooked for my family for a lot of years. But given a choice, cooking was a necessity, not a hobby or something to geek out on. There was always something more interesting to obsess about. Before I finished writing the book I started watching the “Food” and “Cooking” channels in marathon binges. I like the baking championships because the contestants talk about flavor combinations and the chemistry of different ingredients. I was surprised at how much I already knew. Then I discovered “Good Eats,” with Alton Brown. He explains the chemistry and the why of each step in the cooking process. That makes the difference in my mind. If I know how things work, then the process becomes easier, and altering the procedure less crazy. I’ve begun experimenting with marinades. I begin with citric acid, sweet, and salt: lime juice, pineapple chunks, and soy sauce for salmon. Cranberry sauce and dry mustard for ham. I’ve only just begun. So, I started a FaceBook page “Witch’s Kitchen” to continue the conversation about food and making the kitchen the heart of the home. 2) Before cooking re-entered my life, I was a lace maker. There is something about defining air with thread that touches me deeply. I belonged to an international guild, attended multiple meetings, taught classes, designed patterns, and entered my work in contests. Bobbin lace is weaving without a loom. The bobbins hold the reservoir of thread. I wove together 4 threads—two pairs of bobbins, and very rarely did I have to work with more than two pair at any one time—place a pin to hold it in place and moved on to the next two pair. The patterns become the ultimate dot to dot picture. I made a fan in Chantilly lace out of black silk thread with 120 pairs of bobbins. Twist, cross, place a pin, twist, cross. I becomes a meditation and the world falls away. 3) Growing up my parents enrolled me in ballet classes to strengthen my ankles and cure a pronation walking pattern. Um. That may have been why I started at the age of seven, but it doesn’t explain why I practically lived in the dance studio for the next twenty years and taught ballet for another seven. In high school and college I danced and taught in a semi-pro regional company. The Christmas season after my son was born I danced several roles in the “Nutcracker Suite” 12 times in 14 days. I lost all the baby weight and then some. Then I broke my ankle in two places and dislocated it 90°. That was then end of performing and I had to step back to teaching only. Even now when the only organized dance in my neighborhood is country line dancing. I am active as often as I can, teaching when needed. Dance competition shows on TV are an obsession. I get absolutely angry when fans vote popular personalities into the finals when I can spot every technical mistake in carriage of the shoulders, splayed fingers, and stiff feet. My sanity depends upon the glory of moving my body to music in synchronization with other dancers. It becomes more than music and planned steps. It is Dance! 4) As soon as I learned how to read—before kindergarten my mother told me—I began reaching for history books and historical novels, or movies and TV shows in an historical setting. From Robin Hood to Queen Elizabeth Tudor, I was hooked on odd politics and the graceful flow of costuming from previous eras. But more than that, I reveled in the changing cultures, manners, and personalities that meshed together and somehow led to the modern world. Stonehenge is the most magical place on Earth, but Avebury comes close where the standing stones are a part of everyday village life. Wandering the Roman Wall at Carlisle at sunset, I was able to strip away anything modern improvements and recreate in my mind the original city and surrounds. Okay, so make that British History as the focus of my fascination. My B. A. degree is in history. I married a bagpiper—he’s also a highland dancer—and fell in love with the romantic view of Highland History invented by Queen Victoria. My “masterwork series” of books, “Merlin’s Descendants” reflects my love of history. Each book involves real historical events and personalities, insert a descendant of Merlin who has to nudge events to make them turn out the way we remember. The five book series made me realize that I am a generalist. I know a little bit about a lot of different things but am expert in few. That sounds a lot like the rest of my life. And my writing. 5) My last Geek Out is of course writing and was my first true love. My older sister tells me that I came home from school the first day of first grade spitting mad because the teachers wanted me to learn to read before I learned to write. I’d already taught myself to read so I wouldn’t have to waste time in school. How could I write the stories in my head if teachers insisted I start over learning to read first? So Mom and my siblings set about teaching me to form letters and letters into words, words into sentences. Dad was my first proof reader. I haven’t stopped writing since. “A Spoonful of Magic” might be my latest book. But it certainly isn’t my last. I’m already working on three others, historical, contemporary, and post-apocalyptic. I can talk about character development and plot structure for hours and gain new energy for the next day’s word count. Looking back, all my geek outs feed my writing. Daphne Deschants has the ideal suburban life—three wonderful children, a coffee shop and bakery, and a deceptively perfect husband. When she uncovers dangerous secrets beyond her husband’s perfect exterior, she finds evidence of his infidelity and a whole new world of wizards, magic and mayhem. 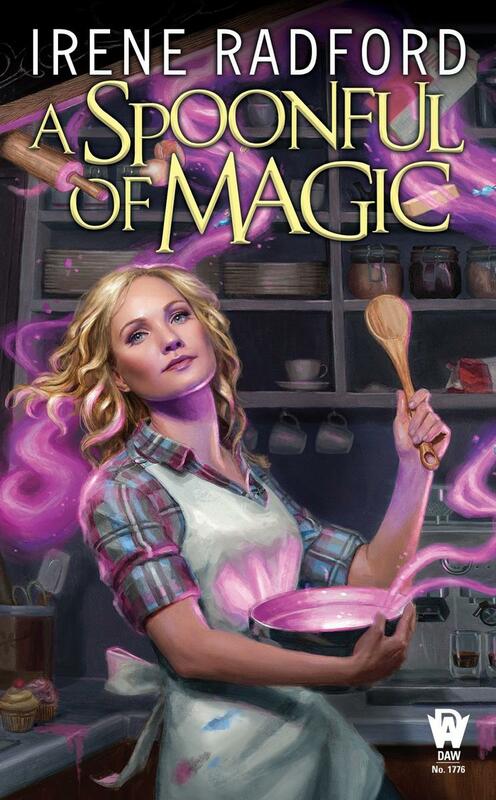 Suddenly, Daphne is part of a world she never imagined–where her husband is not a traveling troubleshooter for a software company, but the sheriff of the International Guild of Wizards, and her brilliant children are also budding magicians. Even she herself is not just a great baker and barista–she’s actually a kitchen witch. The discovery of her powers is only just beginning. In the midst of her chaotic new life, another problem is brewing. Her husband’s ex-wife, a dangerous witch, has escaped from her magical prison, hell-bent on revenge. Now Daphne must find a way to harness her new powers and protect her family – or risk losing everything she holds dear. 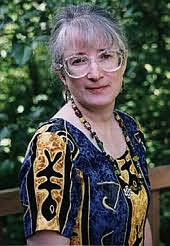 Irene Radford is the author of the Dragon Nimbus (The Glass Dragon, The Perfect Princess, The Loneliest Magician, The Wizard’s Treasure) and the Dragon Nimbus History (The Dragon’s Touchstone, The Last Battlemage, The Renegade Dragon) series, often appears at conventions in the Oregon-California area. She is the author of the Stargods and Merlin’s Descendants series as well, and is also one of the founders of the Book View Cafe. She can be contacted via her website, www.ireneradford.com.